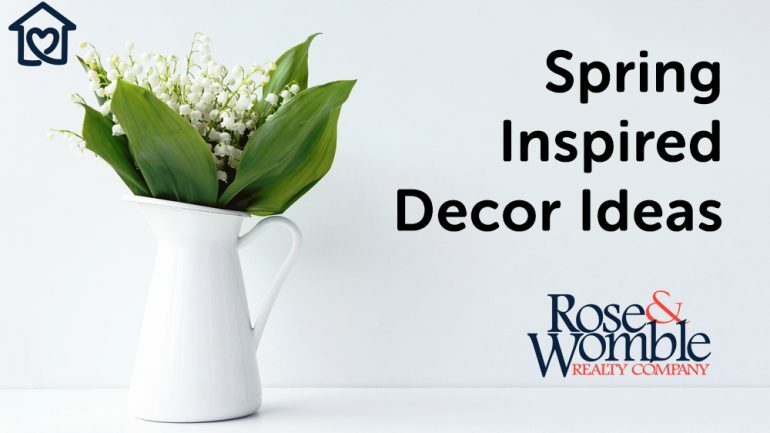 Spring Inspired Decor Ideas - Rose & Womble Realty Co.
It’s spring time! Add bursts of bright color, energetic patterns, and lively springtime motifs to your home to effortlessly transition it into spring. 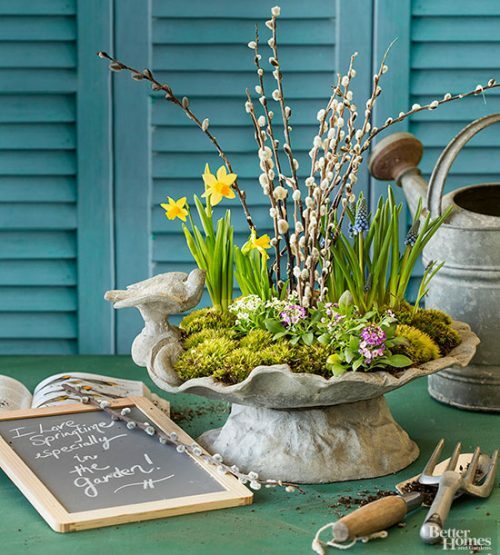 Bring a spare birdbath indoors to create living artwork. A shallow model can hold just enough soil to make a pretty display of moss and spring-flowering bulbs. It’s the perfect miniature garden to enjoy indoors before your outdoor landscape blooms. 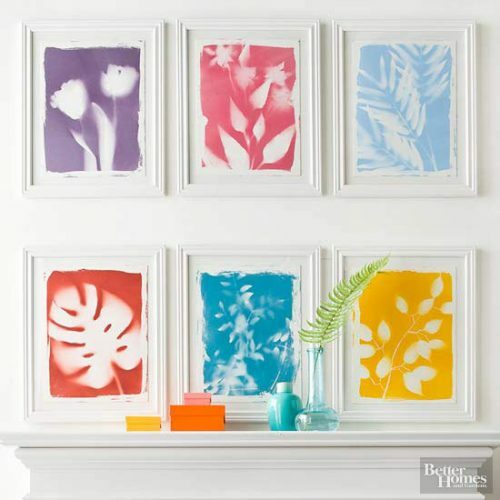 A symmetrical grouping of flower prints turns a blank wall space into a conversation piece. With a few simple supplies, you can make a series of botanical prints like these, customized to your color and style preferences. See how to make these prints. Evoking tabletop conservatories of old, a pretty wooden birdcage makes a fanciful three-dimensional frame for a seasonal display. 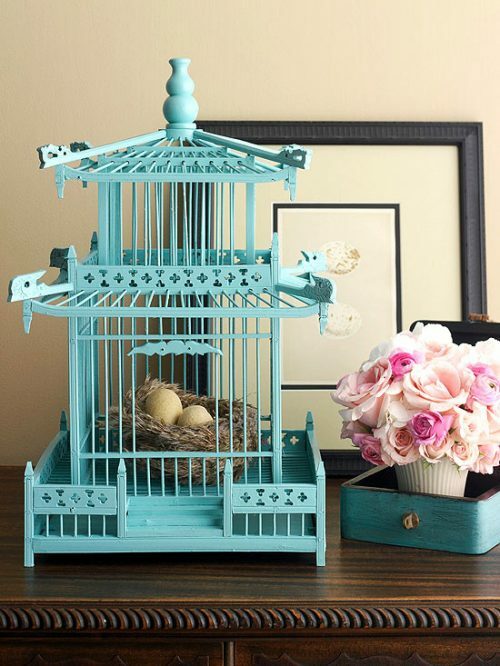 Set an upbeat mood in an entry with a vibrant-color cage holding a feather nest and faux eggs or a small flower arrangement. Revitalize an existing gallery wall by painting wooden frames with varying springtime shades, like pink, cerulean, and sunny yellow. For floral flair, add silk flowers to your wall art, like the blooming antlers of this room’s mounted ceramic deer. Check out some Gallery ideas here. 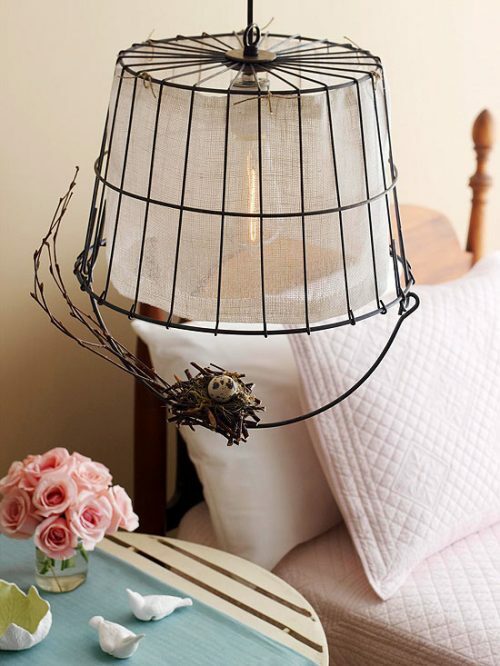 A vintage wire egg basket is the perfect starting point to create a distinctive light fixture. Look for a basket with an interesting pattern and a hole in the bottom for wiring. To fashion a shade, cut a strip of sheer fabric to the length and width of the inside of the basket, plus 1 inch for finishing. Sew the strip into a tube, and stitch or glue to finish the top and bottom edges. Tie the shade to the basket using twine and a large embroidery needle. Add pattern to a headboard by wrapping it with a yard of mod floral fabric. 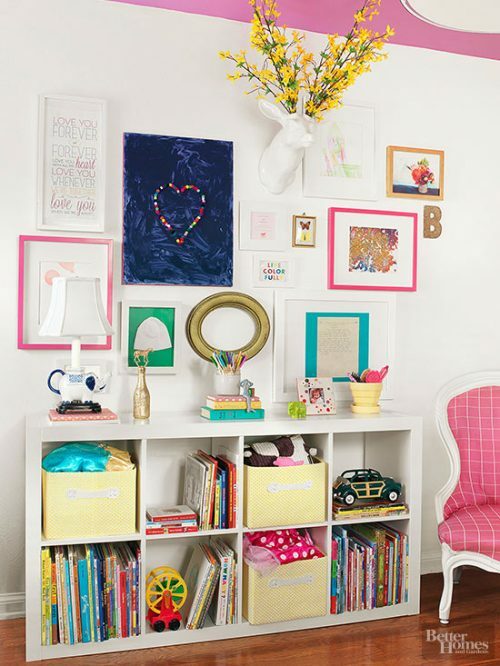 Adorn bare walls with inexpensive album frames filled with patterned paper to tie in your color scheme. Add glitz to an existing bedside table with metallic paint.